Home » BHPetrol » Food n Beverage » lucky » lucky draw » milo » Nestle » purchase » spend » vouchers » WhatsApp » Peraduan MILO Ais Krim WhatsApp & Menang Bersama BHPetrol! 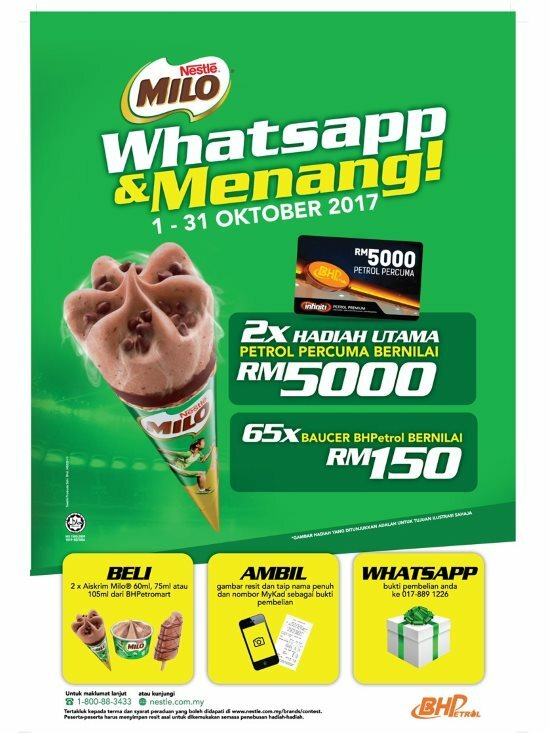 Peraduan MILO Ais Krim WhatsApp & Menang Bersama BHPetrol! Buy any two (2) Aiskrim MILO (60ml, 75ml and/or 105ml) from BHPetromart during the Contest Period. Snap a photo of the official receipt. Send the photo of the official receipt, type your full name and MyKad number via WhatsApp to 017-889 1226. Keep the official receipt as proof of purchase. Visit Peraduan MILO Ais Krim WhatsApp & Menang Bersama BHPetrol contest terms & conditions page for more details.